Updated Tuesday February 13, 2018 by South Lakeland Baseball. There is a new bat restrictions for all Babe Ruth and Cal Ripken leagues across the country effective in 2018. Please do not purchase a bat without educating yourself on the changing bat requirements. 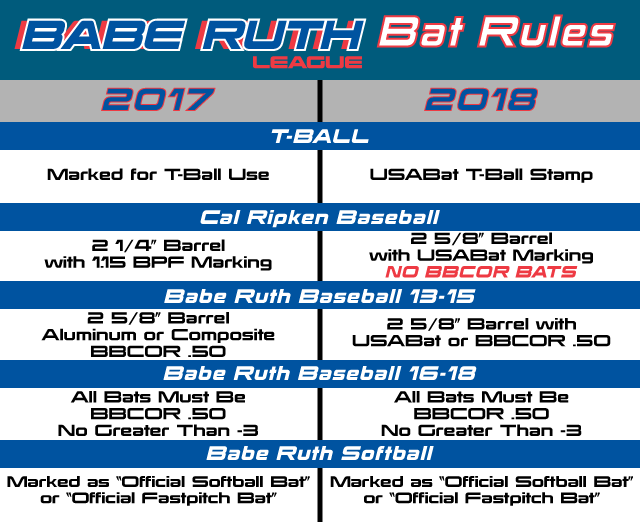 As required by Babe Ruth League, South Lakeland Babe Ruth League will only allow 2018 approved bats during the spring of 2018 regular season as well as the All Stars season. Below is a link to the Babe Ruth League website with all relevant information.